287 Commonwealth is located on the north side of Commonwealth, between Gloucester and Hereford, with 285 Commonwealth to the east and 291 Commonwealth to the west. 287 Commonwealth was designed by Rotch and Tilden, architects, and built in 1892-1893 by Connery & Wentworth, masons and builders, and Ira Hersey, carpenter, as the home of Herbert Mason Sears and his wife, Caroline B. (Bartlett) Sears. 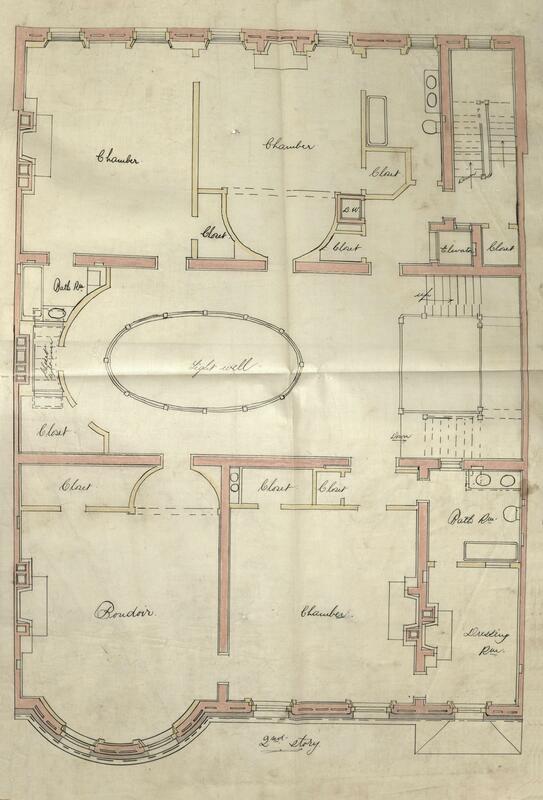 He is shown as the owner on the original building permit application, dated March 31, 1892, and on the final building inspection report, dated November 13, 1893. 287 Commonwealth was built on a 55 foot wide lot composed of two lots purchased on January 19, 1892, by Caroline Sears: a 28 foot lot purchased from William A. Burnham and a 27 foot lot purchased from Frank G. Turner. 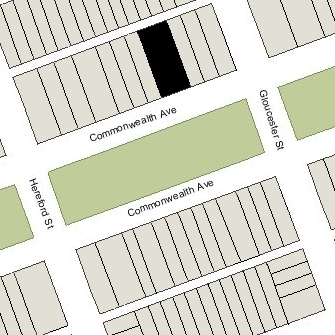 Both lots had been part of a 190 foot parcel running west from the corner of Commonwealth and Gloucester previously owned by real estate dealer Henry Whitwell. He had purchased the parcel on April 1, 1872, from a real estate investment trust formed by Grenville Temple Winthrop Braman, Henry Dwight Hyde, and Frank William Andrews. The land was part of one of four tracts of land purchased by the trust on March 1, 1872, from the Boston Water Power Company. Click here for an index to the deeds for 287 Commonwealth. Herbert and Caroline Sears had married in June of 1891 and then lived at 170 Beacon. By the 1893-1894 winter season, they had made 287 Commonwealth their home. Herbert Sears was a banker and trustee of estates. 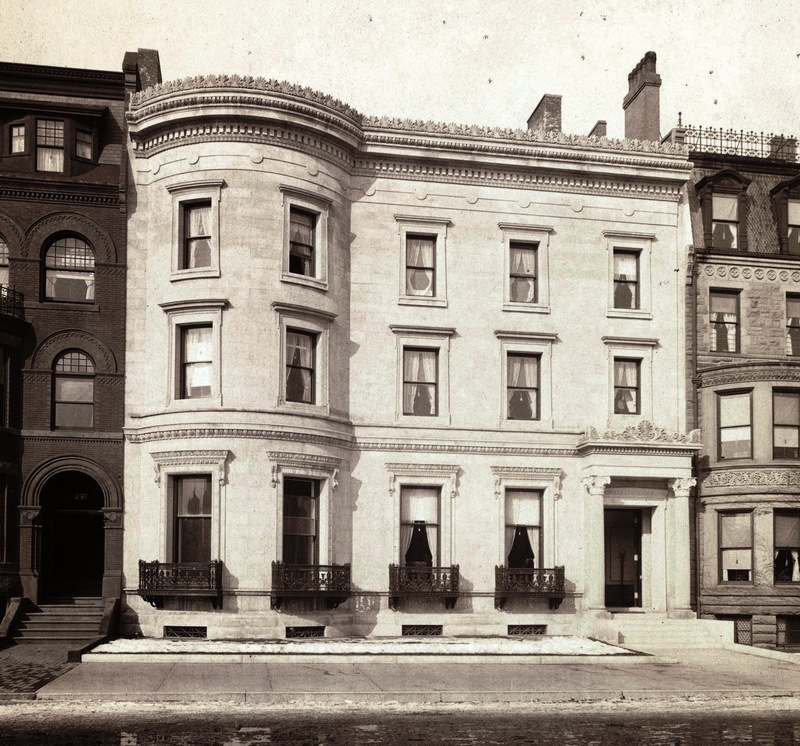 In her book, Ogden Codman and the Decoration of Houses, Pauline C. Metcalf indicates that, between 1903 and 1910, the Searses retained Ogden Codman, Jr., to provide interior decoration at 287 Commonwealth. Caroline Sears died in January of 1908. Herbert Sears continued to live at 287 Commonwealth until his death in February of 1942. On December 2, 1942, 287 Commonwealth was purchased from Herbert Sears’s estate by Mrs. Lillian (Lydia) F. (Reilly) Clinkard, the former wife of Alfred Harper Clinkard. She lived at 103 Marlborough. On May 20, 1943, 287 Commonwealth was purchased from Lillian Clinkard by Fred L. Arata, a retail liquor dealer and real estate investor. He and his wife, Annette Flossie (Crovo) Boggiano Arata, lived in Brighton. In August of 1943, he applied for (and subsequently received) permission to convert the property from a single-family dwelling into a lodging house. Based on the City Directory entries, it appears that 287 Commonwealth had been converted into 12 to 14 apartments by the early 1950s. The legal occupancy remained a lodging house. On April 5, 1954, Fred Arata transferred the property into his and his wife’s names. On April 28., 1960, 287 Commonwealth was acquired from Annette Arata by Dr. Edward Francis Bowman, a physician. It continued to be apartments (legally a lodging house). 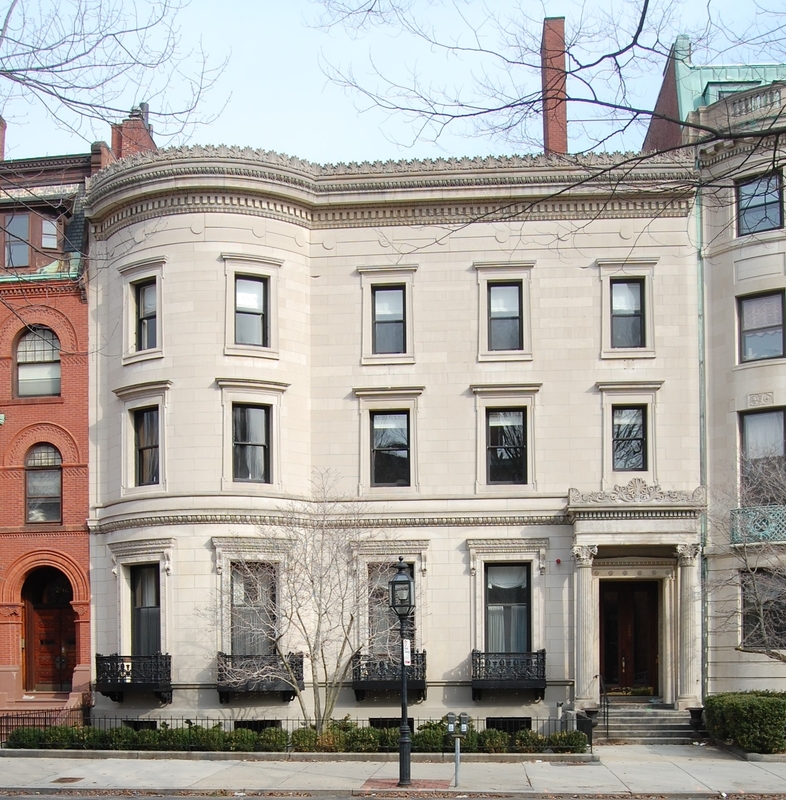 After acquiring 287 Commonwealth, he moved his medical offices there from 322 Beacon; he and his wife, Doreen Simpson (Woodyatt) Bowman, lived at 149 Beacon. On March 26, 1964, 287 Commonwealth was acquired from Edward Bowman by the International Institute of Boston. It previously had been located at 190 Beacon. The International Institute of Boston was established in 1924, part of a national effort started in 1910 in New York City by Edith Terry Bremer under the auspices of the Young Women’s Christian Association. It’s goal was to assist newly arrived and second-generation immigrant girls and women by providing English classes, recreational and club activities, and assistance in dealing with employment, housing, naturalization, and other problems. Among the organization’s principles was “keeping close to the thinking of foreign communities as a whole” and, towards that end, the Boston Institute began with a staff drawn from a diverse group of nationalities. The overall goal, as summarized in Raymond A. Mohl’s The International Institute Movement and Ethnic Pluralism was that “diversity rather than conformity, cooperation rather than conflict, was the essence of American democracy.” In 1935, the International Institute of Boston joined a number of chapters in other cities in ending its affiliation with the YWCA and forming a new national organization, the National Institute of Immigrant Welfare, which Edith Terry Bremer was the founder and first executive director. On November 12, 1997, 287 Commonwealth was purchased from the International Institute by Gordon Reger, trustee of the Gordon Reger Acquisition Trust. In August of 1997, prior to taking title to the property, he had filed for (and subsequently received) permission to convert it from organizational meeting rooms and offices into eight apartments. On December 15, 1997, Gordon Reger transferred the property to 287 Commonwealth, Inc. (Patrick A. Marrano, president). In July of 1998, Gordon Reger filed for (and subsequently received) permission to reduce the number of apartments from eight to six by combining three units. 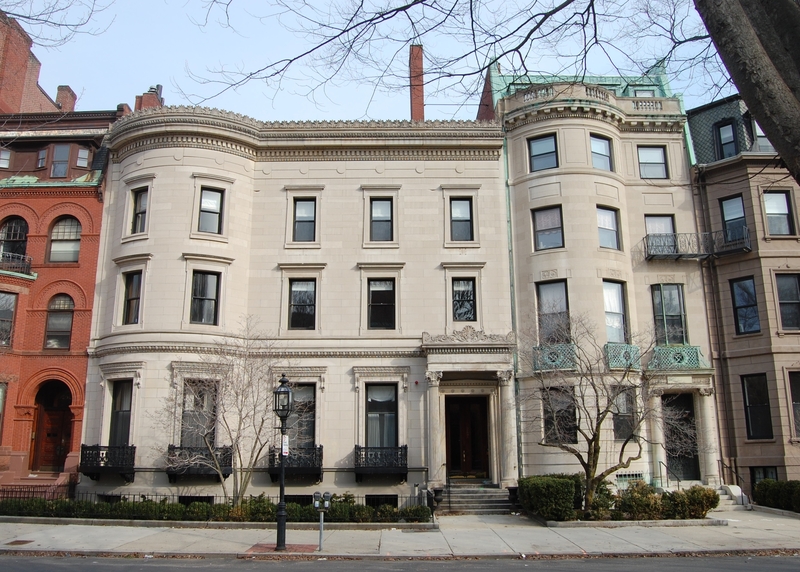 On November 19, 1998, 287 Commonwealth, Inc., converted the property into six condominium units, The HMS Sears House at 287 Commonwealth Avenue Condominium.